The Doctoral Training Program (DTP) is one central training component of the MCLS, the Munich Center of the Learning Sciences. 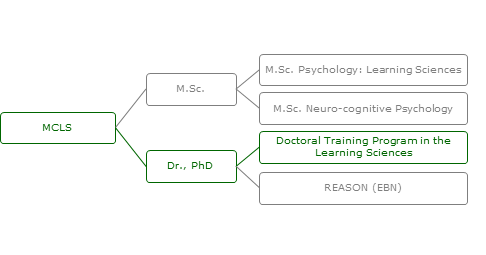 The main goals of the DTP include facilitating access to methods and skills of the participating disciplines to the doctoral students, support in designing and conducting state-of-the-art dissertation research projects, doctoral research quality ensurance in the context of the MCLS through systematic support, and the integration of the doctoral students into the relevant scientific communities. The DTP will directly contribute to a substantial advancement of the scientific knowledge on learning and research methodologies in the Learning Sciences due to its interdisciplinary research approach. In addition, as a more indirect effect of the program, also expected is the improvement of research through better qualification of young researchers with respect to methodology, but also with respect to knowledge and understanding of research on learning across different disciplines. The international nature of the program is aimed at fostering international visibility and the international network of research in the Learning Sciences.